The project aims to document and support local farmers who grow wild, low-bush blueberries in Maine in the face of pressure from corporations that produce industrial, high-bush blueberries. Inspired in part by the work of Marie and Dell Emerson, blueberry farmers from Washington County who have championed the way of life practiced by their peers, the project has attracted undergraduate researchers, community activists, and several UMaine New Media classes to document this extraordinary plant and its impact on the state of Maine. 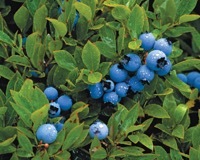 Documenting the joy and the struggle of this endangered way of life is the Maine Wild Blueberry Museum. This comprehensive virtual museum features videos and information gathered by students about the storied fruit, from its origins in Maine’s unique glacial till and place in Wabanaki culture to its role in the Civil War and renowned health benefits. The site is designed by New Media Majors Ashley Duggan and Eli Farnham, who also produced a successful social media campaign–including iMessage stickers that reached the App Store’s “Top Ten in Food and Drink,” alongside fast-food juggernauts like McDonalds and Domino’s Pizza. Duggan received a Maine Tourism Award for her work to promote this community. The Wild Blueberry Museum was a featured project at the fourth biennial Digital Humanities Week on the University of Maine campus from 2 to 6 October 2017. Organized by Still Water in collaboration with departments ranging from the McGillicuddy Humanities Center to the Emera Astronomy Center, the 2017 Digital Humanities Week featured 24 events ranging from ad hoc hackathons to formal presentations. 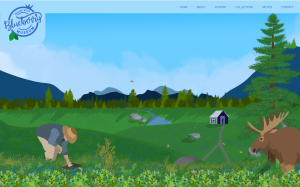 In another project highlighting sustainable practices in Maine, Blais was also awarded a Research Reinvestment Fund grant with graduate student Bill Giordano to develop a mobile app that gathers data from greenhouses across the state. The goal is to compare conditions such as humidity and soil acidity to crop yields in order to discover best practices for growing particular strains of fruits and vegetables in the winter months. Conclusions from these data could allow Maine’s farmers to make their livelihood during all four seasons and contribute to a healthier diet across the state.